Reception following the first church wedding in West Vancouver. Held in Navvy Jack's old home. 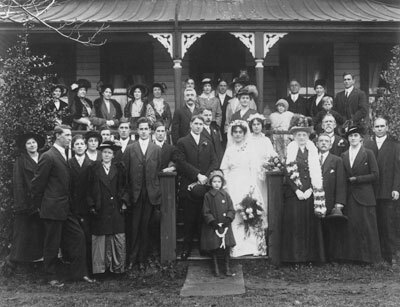 The Wedding of Miss Elizabeth Catherine Lawson, daughter of Mr and Mrs John Lawson, and Mr. W.J. Pitman. This house, now numbered 1768 Argyle street, was formerly the home of John Thomas or Navvy Jack. On either side of this group are the two holly trees whcih suggested the name Hollyburn to Mr Lawson.